FFA - People who push the false Islamophobia narrative are advocating Sharia law, trampling other people’s free speech rights, and hurting public safety. 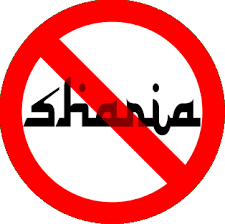 Approximately 1.7 million Muslims in America believe Sharia is superior to the United States Constitution, and approximately 800,000 Muslims in America believe violent jihad would be justified to make Sharia superior. Failure to confront this issue could have dire consequences for our freedoms. Organizations with links to the Muslim Brotherhood like the Council on American Islamic Relations (CAIR), Islamic Circle of North America (ICNA), and Muslim Student Association (MSA) together with the leftist media and educational institutions who empower them are using grade school humiliation tactics of name calling and social stigmatization to intimidate people away from criticizing Islam. Those who use the term Islamophobe to label and stigmatize people who criticize Islam are enforcing a top tenet of Sharia law. Muslims are instructed by the Quran to strongly oppose anyone who criticizes Islam even if that means brutal violence. Quran 5:33 states "Maim and crucify the infidels if they criticize Islam." Many Americans personal and professional lives have been “maimed” for criticizing Islam on social media and in the marketplace and classroom. The consequences of being labeled an Islamophobe can cost a person their employment, educational opportunities, business relationships, and friendships. The threat of encountering such personal costs for being labeled an Islamophobe are having a chilling impact on the rights of Americans guaranteed by the First Amendment to the United States Constitution. The fear of being labeled a racist or Islamophobe has intimidated scores of Americans to forego saying anything about Islam. Such stifling of free speech impairs public safety and helps the Islamist political agenda to go unnoticed and therefore not countered. It appears that people who push the Islamophobe false narrative believe their First Amendment Right is superior to the First Amendment Right of the people they stigmatize as Islamophobes. They know that their punitive name calling tactics can “maim” people’s socio-economic status. Consequently, they know that many people will give up their free speech right to criticize Islam in order to avoid such “maiming” consequences. The Islamist and leftist progressive will to win the political correctness game at the cost of “maiming” people’s socio-economic lives indicates that they believe their speech is superior to Americans who express legitimate concerns regarding Islam. The Center for Security Policy commissioned a poll in May 2015 which found that 51 percent of Muslims in America preferred Sharia courts over the legal system governed by the U.S. Constitution. The poll also found that nearly 25 percent of Muslims in America believe the use of violent jihad was justified in establishing Sharia. Pew Research reports that there are an estimated 3.3 million Muslims living in America. Therefore, based upon the Center for Security Policy poll results approximately 1.7 million Muslims in America believe Sharia is superior to the United States Constitution and approximately 800,000 Muslims in America believe violent jihad would be justified to make Sharia superior. Islamophobia campaigns attempt to discredit prominent, safety conscious Americans who voice support for vigorous efforts to counter terrorism and the Islamist agenda. Islamophobia propaganda and “maiming” tactics have caused people to remain silent regarding situations that they have observed that could pose a public safety risk from terrorism. Fear of being branded an Islamophobe played a role in suppressing communications that may have had different results for the lives of thirty-six people in San Bernardino and 102 people in Orlando. Townhall.com issued a report titled "Neighbor Didn't Report Suspicious Activity of San Bernardino Killers For Fear of Being Called Racist." The Townhall article by Katie Pavlich on December 03, 2015 reported in part “According to a local Los Angeles news report, a neighbor of San Bernardino massacre suspects Syed Rizwan Farook and Tashfeen Malik didn't report suspicious activity at their apartment for fear of being accused of racism." Floridatoday.com issued a report titled "Mateen’s employer ignored complaints about his death threats because he was a Muslim." The Floridatoday.com article reported in part “Gilroy, a former Fort Pierce police officer, said Mateen frequently made homophobic and racial comments. Gilroy said he complained to his employer several times but it did nothing because he was Muslim." Many in the liberal left media and educational institutions appear to also follow and advocate for other tenets of Sharia law which instruct Muslims to hate Christians and Jews. Quran 5:51 “O you who have believed, do not take the Jews and the Christians as allies. They are [in fact] allies of one another. And whoever is an ally to them among you - then indeed, he is [one] of them. Indeed, Allah guides not the wrongdoing people.” Quran 9:30 "The Jews and Christians are perverts, fight them." The leftist media and educational institutions are complying with and enforcing a top tenet of Sharia law with their Islamophobia propaganda. Such “maiming” propaganda scares Americans away from reporting suspected Islamic terrorism and thwarts the sharing of facts regarding the Islamist political agenda to subvert the United States Constitution in favor of Sharia law. Florida Family Association is spearheading numerous projects with the goal of countering Islamophobia propaganda. These projects include countering CAIR’s “maiming” of Americans who are brave enough to oppose Islamism and countering the Huffington Post’s proliferation of Islamophobia propaganda.